Here's a site that lets you draw a diagram of your traffic accident: Accident Sketch. Here's a sketch I made of a nasty accident involving two cars, a bus, a motorcycle, and a pedestrian. Offline Gmail is still an early experimental feature, so don't be surprised if you run into some kinks that haven't been completely ironed out yet. We've been using offline Gmail internally at Google for quite a while (I've read thousands of messages and answered hundreds en route to visit my son and my daughter). And it's saved me more than once when my home network connection ran into issues (we have squirrels at home that love to chew through outside cable wires). Now we're ready to have a larger set of people try it out, so we're making it available in Gmail Labs for those of you who want to test out Gmail's latest and greatest. Chicago (IL) - Google Drive, or Gdrive as it is better known, has to be the most anticipated Google product so far. When it arrives, Gdrive will likely cause a major paradigm shift in how we use computers and bring Google one step closer to dethroning Windows on your desktop. service has the potential to eclipse even Gmail, Google's second best-known product after their google.com search engine. That said, it's no wonder users have been ripe with anticipation for years - yes, that's how long the rumors have persisted. Gdrive is basically online storage where Google servers have enough capacity to hold the entire contents of your hard drive. It will likely also come with enough brains to do cool tricks now with bigger things down the road - like booting your computer from online drive to load the Google operating system. 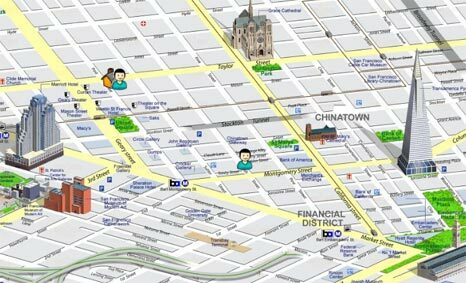 OnionMap is a Korean site that offers 3D tourist maps of popular cities around the world. Each map contains pixel drawings of landmarks as well as shops, hotels and public transport. The site also allows you to create a profile and should you live/work in one of the cities covered, you can place a pin on the map. Even though the site looks good, it is a little limited in terms of the amount of information included. For example, in San Francisco only deluxe hotels and luxury restaurants are listed. Note2Email is a simple web form that you may use for sending email messages anonymously to just about anyone - no need to create any account. Your IP address is not passed in the message header so your identity remain hidden and the email recipient will never know who exactly sent that message and from where. Other than sending anonymous emails, this service will also come handy if you are sitting on a public terminal and want to quickly send yourself an email without logging into your own web account for security reasons. You may send unlimited number of emails with Note2Email but one at a time. Obviously there’s potential for misuse so you can ask them to blacklist your email address so that people can’t send you messages anonymously. Here's an example email I sent to myself, it was delivered in less than 30 seconds. This note was sent to you through the web service note2email.com . (c) 2008 note2email.com. All rights reserved.